Home › What’s In A Name? 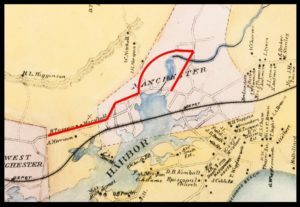 At the Annual Meeting on June 5, 2018, John Huss gave a presentation that focused on some of the many intriguing names in Manchester’s history. Below is the text of his talk. We begin our journey with a visit to one of the Town’s most famous institutions, the Masconomo House Hotel! 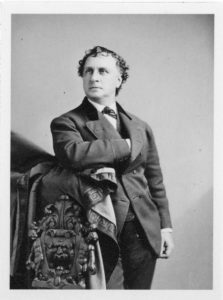 In 1878, former actor Junius Booth and his actress wife, Agnes, decided that the best way to entertain their wide circle of theatrical friends was to attach a Grand Hotel to their existing home overlooking Singing Beach. The choice of a name for a hotel which could accommodate 300 guests was easy. It was to be built on Masconomo Street and that name was already part of local folklore. In fact, the name Masconomo goes back to June 13, 1630! Not far from the entrance to what was now Manchester Harbor, the English ship Arbella was about to drop anchor. On board was a party of English colonists led by John Winthrop, the newly elected Governor of the Massachusetts Bay Colony. He was one his way to Salem to assume his new post. Let me explain that while this encounter took place in 1630, our Town Seal bears the date 1645, that being the year Manchester became an official separate and distinct township. The Pawtuckets were an Algonquian-speaking band of people who spent their winters in Lowell and their summers in Ipswich, Hamilton, Wenham and along the shoreline of Cape Ann. The English later referred to the Pawtuckets as the “Agawams”, the name of one of the villages where they lived. Their primary summertime fort and residence was atop Castle Hill in Ipswich, now of course the site of the fabulous Crane Estate, one of the jewels of the Trustees of Reservations. Although no physical description of Masconomo exists from that time, Indian men living here were tall, about 6 feet – some even a foot taller! He may have worn an animal skin around his waist and legs, fastened together with a snake skin. This portrait of Masconomo was painted by local Artist William Henry Tappan in 1895, on the occasion of Manchester’s 250th Anniversary Celebration. It was originally a full-length painting on canvas; only the head and shoulders have survived as you see here. Masconomo had good reason to be friendly with the English. A plague from 1611 to 1619 had reduced the Agawams by one-third, only about 1,000 people surviving. They especially needed help protecting themselves against the Tarrantines, fierce warriors from Maine who frequently attacked their brethren to the south. One particularly brutal custom of the Tarrantines was to tie prisoners to a tree and then bite off pieces of their flesh until the victims died. Matters were made worse three years after John Winthrop’s arrival by an outbreak of smallpox that killed about half of the remaining Agawams. Masconomo now needed help from the English more than ever, so in 1637 he made his first offer to sell land to the colonists. First to go was the Agawams’ fort at Castle Hill, a transaction commemorated a plaque displayed on one of the brick walls of the Great House. A year later, in 1638, Masconomo signed over all his lands from Cape Ann to the Merrimack River to Winthrop for a sum of 20 pounds. In 1644 he then signed a treaty pledging to be loyal to the English and inform them of any Indian conspiracies. He also agreed to be taught the ways of Christian life. In return the English would protect his people from the fearsome Tarrantines. Masconomo did indeed become a Christian, and in 1655 was given 6 acres to farm. 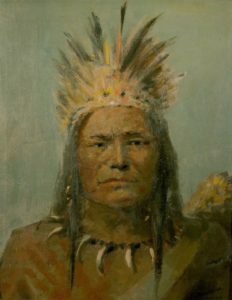 Several years later, in 1658, with almost no Agawams remaining in the area, Masconomo died “poor, disheartened and friendless, as a ward of the state.” Despite this sad end he was given a proper Indian burial appropriate to his status as a sagamore and was buried with his gun, tomahawk and other personal possessions on Sagamore Hill in Hamilton. Years later, a young man unearthed his remains, scattered his belongings, and then impaled Masconomo’s skull on a pole and paraded around town. The youth was punished, but according to Native American tradition when one’s grave was desecrated the person will not rest until there was a proper burial. 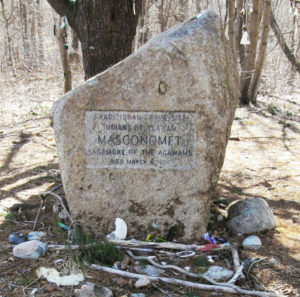 So finally, in 1993, more than three centuries after the death of the last Agawam on Cape Ann, a traditional Native American ceremony was held to put Masconomo to rest at this burial site in Hamilton. A recent visit there shows a variety of tributes are still being placed there in his memory. The legend of Masconomo remains firmly embedded in the consciousness of our community. As mentioned earlier, in 1895 Manchester observed its 250th Anniversary with a celebration that lasted three days! 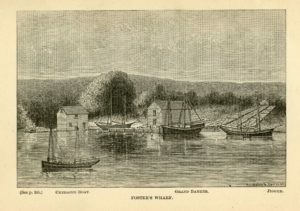 On July 18th, Twenty-thousand spectators – eleven times the local population – surged into town for festivities high-lighted by a re-enactment of Governor Winthrop’s arrival and his meeting with Masconomo. Masconomo was recognized today in Manchester with the park, street, and Knights of Columbus council all named in his honor. But a proposed life sized bronze statue never materialized. In 1938, Manchester’s ElderBrethren, commissioned famed Gloucester sculptor George Aarons to create just such a memorial. But when the Board of Selectman were shown this 2 ½ foot high plaster cast there was shock and anger. 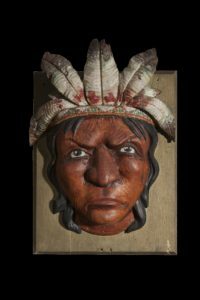 They thought Masconomo looked too feminine or priestly and that the style was too “avant garde.” Aarons had chosen to portray him not as a stereotypical Indian with headdress and tomahawk – something like this carving that once decorated the Masconomo House Hotel. Instead, Aarons used beautiful and simple lines to portray a dignified and proud man. 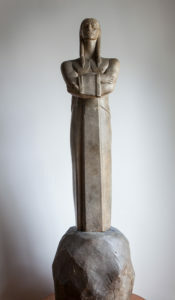 Although a life-size statue was never completed, private funds were raised in 1983 to purchase the original plaster model from Aaron’s estate, and a bronze replica was made. It was now displayed at the Town Hall. Aaron’s original plaster version can be seen at the Manchester Historical Museum. Masconomo, a man of peace and dignity. A man we should never forget. Not surprisingly, many of the oldest streets in Manchester are named after early residents, but only a few of those first settlers also had a brook named in their honor as well! This distinction goes to William Bennett who in 1640, settled with a family of three in what was then the small village known as Jeffery’s Creek. Several years later, Bennett’s name appears on the petition to Governor John Winthrop to separate Jeffrey’s Creek from Salem. This was approved in 1645 when the town officially became Manchester. The fact that Bennett, a highly regarded carpenter, had done work for the Governor may have helped the case for local independence! William was a good, hard-working member of the new little community; he was Manchester’s Constable and most important, in 1662 he built and operated the Town’s first Grist Mill. It was a tidal mill, perched on two rock ledges where a brook still empties into the harbor. Here villagers would bring their wheat to have it ground into grist to make the flour for the baking of bread. William and his family lived in this tidy red house which dates back to 1675, but it unknown whether William was the original owner and perhaps its builder. In any event, he owned much of what was known as Bennett’s hill, including a pond north of his home. This was the source of Bennett’s Brook which in turn flowed into the Grist Mill below. The pond was also used to harvest ice in the winter. Even though Bennett was today one of the town’s shortest streets, back in the 17th century, was certainly one of the most important! 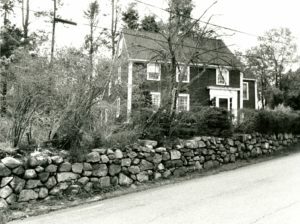 In fact, the only access to downtown Manchester from Salem, Beverly and West Manchester – then known as Newport – was up and over the little street that now bears Bennett’s name. Bridge Street, as we know it today simply didn’t exist. Back then, that land was simply a stretch of mud flats flanking the harbor. This contemporary view of the west end of Bennett Street gives you some sense of the marshy terrain back then. This meant the only way the reach the center of town from the West was to climb up this winding little road past the Bennett’s house, descend to what was now the intersection of Pine, turn left, travel north a short way, turn right on a lane that ran along the base of Powder House Hill and pass just north of the pond that was fed by Sawmill Brook. This put you on the west end of Friend Street. Now, proceed down Friend to School Street, turn right, cross a small bridge spanning Saw Mill Brook and at last, you enter downtown Manchester! In 1771, after some three years of weighing various options to improve access into Manchester from the West, the town finally approved the purchase of land from the Bennett and Cheever families in order to build bridges across the mud flats below Bennett’s Hill and Bridge Street became a reality. This created a new, very busy intersection where Bridge, Bennett, Pine and Central Streets – all unpaved – converged. On the right was once Simeon Sweet’s Livery Stable with a Town Pump and trough to water your horses. In the triangular wedge dead center, Mr. Culbert had a Harness shop. Earlier it had been a cider mill where thirsty travelers could quench their thirst. Over time, the building became a hairdressing shop, then a photographer’s studio, and eventually, a private residence. With Bridge Street now open, Bennett Street effectively retired from public view. In fact, in an 1830 history of the town, it was referred to simply as “Back Street”. While commercial traffic certainly favored Bridge Street to the Back Street, scores of youngsters still enjoyed sledding down Bennett Hill. And starting in 1874, hundreds more trudged there every day to attend Story High School when an existing building was converted for the purpose of higher education! 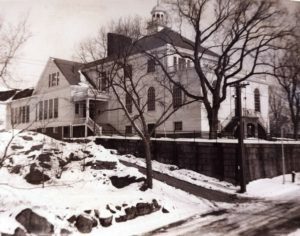 Named in honor of Dr. Asa Story, a much beloved member of the School Committee, it was greatly enlarged in 1927 as we see here and finally torn down in 1953. A private residence now enjoys the magnificent view from the crest of Bennett Street. 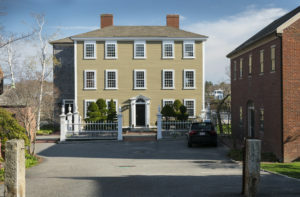 Rich in history, Bennett Street today offers walkers a wonderful panorama of architectural styles, especially its cluster of 17th and early 18th century homes. It was truly a little gem! No venue in our lovely town was more popular than Tuck’s Point. There we gather to picnic, fish, sail or simply enjoy the passing parade of lobster boats and graceful yachts. And it’s also a great place to catch crabs! Here, once the site of one of the earliest town landings, three iconic structures were built in the late 19th century – the Chowder House, the Manchester Yacht Club and the Rotunda. All were built on land sold to the town by Manchester’s original real estate speculator, the Reverend Cyrus Bartol. He asked, and got $5,000 for the land and another $1,000 for an existing wharf. Here are Fish Flakes at another Manchester landing, this one known as Foster’s Wharf at the foot of Ashland Avenue. Around 1725, a local fisherman named Nathaniel Marsters, built this handsome home on Harbor Street. In those days it commanded a clear view all the way down to Fish Flake Point., where Marsters soon built his own wharf and fish warehouse. 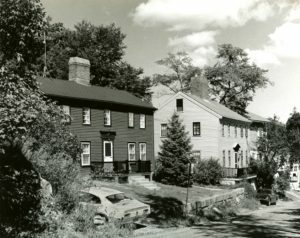 The Marsters homestead stayed in the family until 1785 when it was sold to Captain William Tuck, a man who truly left his mark on Manchester. William Tuck ‘s early claim to fame came as a skilled and successful privateer during the Revolutionary War, commanding the Buccaneer, an eighteen-gun ship that took many British merchantmen as prizes. Ironically, Tuck was probably best known for being captured himself by a British frigate. The captors placed a prize crew on board Tuck’s ship and sailed her back to Nova Scotia, a British stronghold during the Revolution. During the voyage, Captain Tuck, known for his “gift of gab” so ingratiated himself with the British officers that upon reaching Halifax, they invited him to join them ashore for dinner. With the British officers absent and the crew in the rigging attending to the sails, Tuck’s resourceful first mate Daniel Leach and his shipmates managed to smash open the arms chest and seize control of the vessel. When the British officers, accompanied by their American guest returned from dinner – undoubtedly none the worse for wear – they were greeted on deck by Leach who declared them his prisoners and handed command back to Captain Tuck, who happily weighed anchor and sailed back to Boston. Following the War, Tuck proved a man of many other talents. He served as Customs Officer for the Gloucester District, was a Justice of the Peace, and even practiced medicine. He also found time to have four wives and sire 23 children! Captain William Tuck died in 1826 in his Harbor Street home at the age of 86. 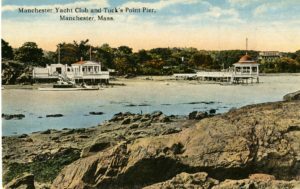 Upon his death, the Town commemorated his distinguished career by naming the waterfront below his home in his honor – and so today we have, and mightily enjoy, Tuck’s Point! What? 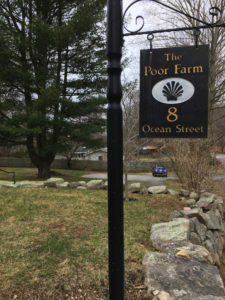 Manchester-by-the-Sea, this affluent community with the fancy-pants name has a “Poor Farm”? At least, that’s what the sign on this house on Ocean Street proclaims! In the 19th century, most of the towns on the North Shore had a Poor Farm” or “Alms House” at one time or another. Poor Houses offered lodging to “just about anyone who wasn’t tacked down”, which meant orphans, children from broken homes, neglected infants, as well as prostitutes and the aged. Many Poor Houses were connected with a Poor Farm, which provided food for the residents, as long as they agreed to work the fields. Today only two remain locally, now both privately owned. Here’s the old Alms House in Essex as seen in the 1880’s. In 1825, the townspeople of Essex bought Captain John Proctor’s Farm to care for the Poor. It included some 100 acres on Conomo Point. The two story building at the right was built to house the indigent residents. The buildings of the Essex Poor Farm are seen at the left in this 1895 photo of Conomo Point. Manchester’s former Poor House still stands, now a multi-family home. It once commanded a sweeping view across a meadow to White Beach. 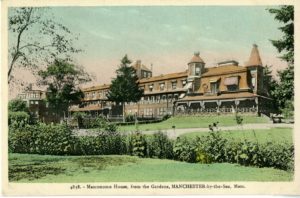 There are all sorts of records from the time Manchester maintained its Poor House, with notes indicating who was staying there, what the funding was, and what was being provided for the occupants. Certainly no one was more diligent in this regard than 29-year old John Lee who lived in this house on School Street. Known to be a very respectable and serious young man, Lee was not only a Town Selectman but also the Overseer of the Poor House. Here we see one of his diaries in which Lee kept copious notes about Manchester, including life in and out of the Poor House. Lee writes that the Poor House was “probably not a bad place to be when Fanny and Lisbeth landed here in 1841”. It turns out that the pair were notorious “Ladies of the Night” who had been bouncing from town to town. One hopes they enjoyed their stay here in Manchester. Here’s another passage from Lee’s diary: “Was called upon by the wife of Mr. A.L. She requested that something be done with her husband or herself as she could no longer endure the treatment she received from him. I went…and found the family miserable. He and his wife quarreled almost continually in consequence, I conceived, of the too full use of RUM.” We assume the lady of the house received immediate assistance from a concerned Mr. Lee. No mention was made of the fate of those living at the Poor House at the time of sale. 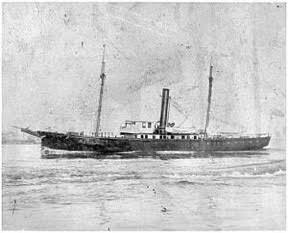 On Wednesday, January 6, 1892, the U.S. Revenue cutter ALBERT GALLATIN was steaming past Singing Beach on her way to Provincetown. Her captain, Eric Gabrielson recalled, “The weather was thick and it had beg[u]n to snow. “ Suddenly, without warning, the ship stopped dead in the water, having struck an underwater ledge. Unable to free the boat, Captain Gabrielson ordered all hands to abandon ship. In an interview published in the Manchester Cricket, the Captain described the harrowing scene. The rest of the crew took to the lifeboats, and soon washed up near Eagle Head, where three of the four craft were destroyed in the pounding surf. The survivors then took refuge in a home owned by the Babcock family on a bluff overlooking the beach. They were soon transferred to the Manchester House Hotel where they “found shelter and refreshment” courtesy of the town selectmen. The next day, the crew was transported to Boston by the Boston and Maine Railroad free of charge. Throughout the community of Manchester Captain Gabrielson was much praised for “acting coolly, standing at his post, calmly giving orders as his ship went down.” In the best tradition of the sea, the Captain was the last to leave its decks. The rock that destroyed the Gallatin was appropriately named Boo Hoo Ledge, having caused tears to raise in many a mariner’s eyes. Even though the ledge was considered a hazard to navigation, it was at the time unmarked. About 50 feet in length, the rock was two feet underwater at mean low tide. Some 18 years earlier, a yacht owned by wealthy summer resident Greeley Curtis had also struck Boo Hoo Ledge. Shortly thereafter the ledge was marked with a spindle but this disappeared three years later in a winter storm and was not replaced as Captain Gabrielson and the crew of the ill-fated GALLATIN were destined to discover. According to the CRICKET, Boo Hoo Ledge takes its name from the peculiar sound it makes at times when a heavy sea washes over it…. which makes as much sense as some of the explanations for the name of Singing Beach! Commanding a prime location on the Common was this handsome circular granite drinking fountain. And no, I have not misspelled “Towne” as the title of this segment might suggest. While it was most certainly the town’s public fountain, we can thank Manchester’s “Towne” family for its welcome presence. 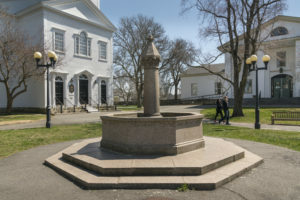 It was donated to the Town in 1895 in memory of Manchester residents John Henry Towne and his wife Maria R. Towne by their children, Henry, Helen and Alice. Their generous gift was to be in place in time for the Celebration of Manchester’s 250th Anniversary on July 14, 1895. And what a party it was! Speeches, music, historic re-enactments, and a huge parade with floats, military units, bands and lavishly decorated carriages such as the one we see in the foreground, owned by Mrs. Gordon Prince, winner of First Prize! That evening the merriment reached new heights with a gigantic hour-long fireworks display! There was also a dazzling electric fountain, which simulated falling streams of water illuminated in many colors. The granite came from a quarry in Maine. It was transported to a workshop in Lanesville where the cutting and shaping took place. The base of the fountain was one solid block of granite, eight feet in diameter and weighs nine tons. The shaft rises 6 ½ feet, and the entire fountain was surrounded by two granite steps. John Henry Towne was a wealthy Philadelphia businessman, and much-respected philanthropist. On 1867, he purchased 25 acres at “Eagle Head” where he eventually built this summer home. He also acquired considerable acreage in the Kettle Cove area. When Mr. Towne died in 1875, his will provided that 85 acres of the Cove property be given to the University of Pennsylvania. That land was indicated on the map as the Pennsylvania Institute Property. The University then created a subdivision plan and began selling-off the lots, most of them between 1884 and 1900. The last lots were sold in the mid-1920’s, all of which resulted in a tidy windfall for UPenn. So now you know why this part of town was known as the University Lane area. Towne had attended the University of Pennsylvania for just one year, but as was obvious, was a significant benefactor. Not surprisingly the University recognized his generosity with an honorary degree. Two final observations about the Towne family. 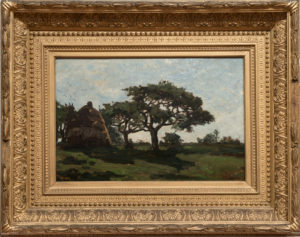 John Henry’s sister, Ann Sophia Towne Darrah, attained considerable notoriety herself, as an outstanding landscape artist. Upon her death in 1872, the MFA held a retrospective exhibit of her work, with 262 of her paintings on display. We are grateful to have several of her oils in our collection at the Trask House. Finally, there was John Henry Towne’s daughter Alice. In 1878 she was instrumental in raising money to buy much of the woodland along Old School Street in Manchester and Southern Avenue in Essex, including what was known as “Cathedral Pines”. This land was now an important part of the Manchester-Essex Conservation Trust. 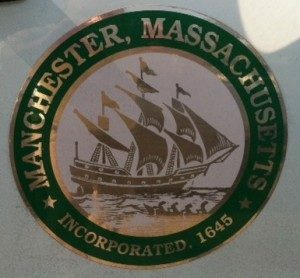 The Towne Family – generous benefactors to the Town of Manchester! Before a certain Harvard professor arrived on the scientific scene in America in the mid-1800s, if someone had been walking in what was now Agassiz Rock Reservation and wondered how those enormous, oddly perched boulders ever got there, the answer might have been: they arrived by a Flood of Biblical proportions…perhaps the type that caused Noah to launch his ark! It took a brilliant, if controversial scientist at Harvard to popularize a far different explanation, that of a natural force called glaciation! Born in Switzerland in 1807, Louis Agassiz came to the United States in 1846; not realizing then that it would become his permanent home. He would go on to become a professor of geology and zoology at Harvard, lecture all across the East Coast, and assemble a collection that would become the Harvard Museum of Comparative Zoology seen on the right. Tireless in his scientific pursuits and publishing more than four hundred scientific papers and books during his life, Agassiz was an extrovert with a big ego who adored his enormous popular following, including himself as this double exposure suggests! He was the unquestioned leader of the natural history movement in America. Today he was probably best known for his ideas about glaciers. Agassiz didn’t originate the theory that there had been an ice age and that enormous ice sheets covered areas where they don’t exist today, but he did popularize the concept. Despite Agassiz’s enormous popularity and fame, he was also controversial. For one, he did not agree with Darwin and his ideas about evolution. While Darwin saw a continuum between extinct species and the ones still living, Agassiz believed that during times of extinction, God would intervene and create new species. Today we would say that Agassiz was a scientist but also a creationist. Back to Agassiz Rock. 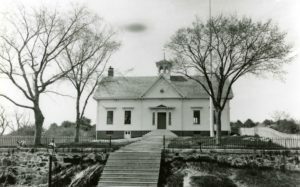 It was believed that Louis Agassiz visited the site at the suggestion of one Frederick Burnham, who then owned this 216-acre property east of northern School Street, There Agassiz was awestruck by two enormous monoliths which today bear his name. Little Agassiz, with its pinkish hue so different from the surrounding ledge sits on top of the hill. Big Agassiz stands at 30 feet tall in the wetland below. It was the largest erratic in Essex County. 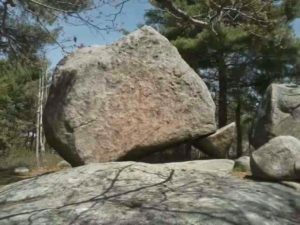 These erratics match granite found in Andover, and it was remarkable to imagine something like Big Agassiz, which was calculated to weigh about 3,763 tons, to have been carried that far by ice sheets on the move. They were deposited in their current location sometime during the end of the last ice age, about 10,000 years ago. They are a reminder that once the landscape here was covered in 2,000 feet or more of ice. Even though it was probably only 9-10 degrees colder then, the summers were not warm enough to melt the winter snow, so the ice cover kept building up over the years. And we thought the winter of 2018 was endless! 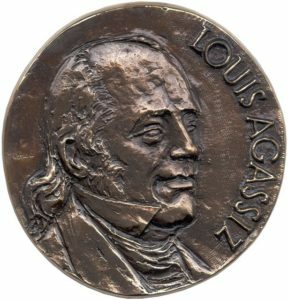 We don’t know how often Louis Agassiz visited the Manchester site, but do know a year after his death in 1874, a group of students from the Essex Institute named the site in honor of the famous scientist. Many years later, in 1957, with funds given to them by Arthur W. Stevens of Boston, the Trustees of Reservations were able to purchase the property and opened the park to the public. If you haven’t paid Big and Little Agassiz a visit lately, make it a must. And be sure to take your grandchildren…they love to be pictured keeping Little Agassiz Rock from tipping over! Keep your eyes peeled as we cruise along the inner harbor to visit our next destination, Peele House Square, a residential apartment complex developed some 40 years ago by Sea Rock Estate. This wharf area for seaside living and pleasure boat dockage was the center of Manchester’s commercial life for centuries. This charming little oil painting in the Museum’s collection shows the area in the 1880’s. 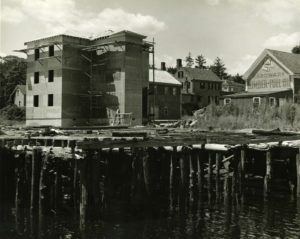 The tall yellow building was Jewett’s Furniture Mill, later a laundry catering to the washing needs of wealthy summer residents. 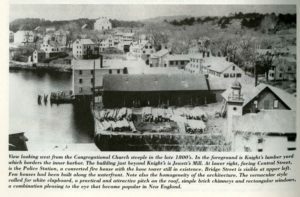 In this photograph, taken from the steeple of the First Parish Church, we see the sprawling coal and lumber yard just east of Jewett’s Mill which was owned and operated by Samuel Knight from 1873 well into the 20th century. Now, let’s visit this historic site from its entrance on Central Street. 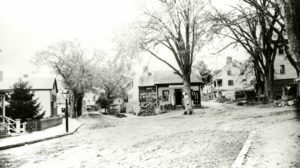 The building on the left was used by Samuel Knight as his office until about 1896 when it became Knight’s Hardware Store. Directly across the Square was a fine old red brick building with a beautiful fanlight above the door. Here, chairs were manufactured during Manchester’s furniture making days. Being brick, it was the only building to survive an awful fire which destroyed much of the surrounding neighborhood in1836. And dead ahead was the centerpiece of the square, the Peele House itself, lovingly restored to its 18th century grandeur. But it’s relatively a newcomer to Manchester. In fact, considering the impact Samuel Knight had on this property, why was it now known as Peele House Square? We have to go to Salem for the answer. 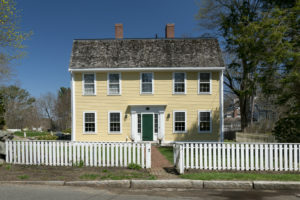 Local Sea Captain Jonathan Peele built his family home at 22 Liberty Street in Salem in 1761, similar in style to the home of Salem’s most successful merchant, Elias Haskett Derby. 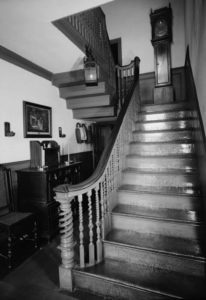 Peele’s house, made of wood instead of the brick used by Derby, was originally two-stories with a third floor gambrel-roofed attic lit by dormer windows. 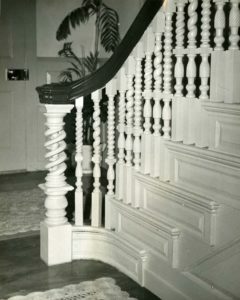 The floor plan and paneling are the same in both houses and the detailing on the staircases of both the Peele and Derby homes are considering among the finest examples of Colonial period carving. Obviously, John Peele had plenty of money, thanks in part to another Salem Sea Captain Jonathan Carnes. In command of the ship Raja, Carnes was the first person to return to the US with a precious cargo of pepper from Sumatra. Captain Jonathan Peele was not only Carnes’ uncle, but also owned the Raja. This first venture into the pepper trade led to many more successful voyages and a fortune for Jonathan Peele. This in turn prompted some grand improvements in the Peele homestead. The third floor gambrel roof was enhanced with the addition of a modern hip roof in the Federal style. The “old” paneling from the first floor was moved upstairs and a new elegant front door was added to the façade. 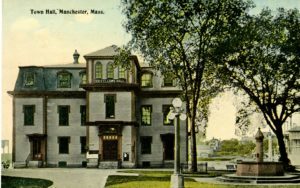 Sadly, by 1940 the beautiful Peele House had, according to the May 25, 1973 edition of “The Manchester Cricket,” become “a rabbit’s warren of apartments, with many additions to the original building.” During Salem’s urban renewal in the 1970’s, the house was condemned and scheduled to be torn down. Since the property was involved in some litigation, the government could not sign the demolition contract so it was offered on public sale. Up stepped Ike W. Colburn of Summer Street in Manchester, a highly regarded architect and owner of Sea Rock Estate. Colburn’s offer of $1 was accepted, thereby saving the htstoric house. It was stripped of its additions and readied for relocation In Manchester. 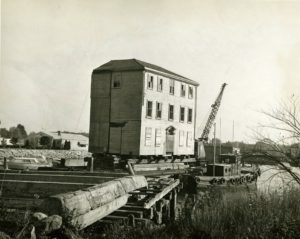 Once jacked up, it was hauled down the street to Salem’s waterfront, and placed aboard a sturdy barge. To the delight of a fascinated crowd on October 21, 1971, the Peele House was towed into Manchester’s inner harbor by tug! I’d like to think that Jonathan Peele would find this method of transport quite fitting for a captain’s house. After passing through the railroad bridge the barge was brought alongside the rotting remains of the wharf and the rest of the former Knight complex which Colburn now owned and was developing for residential use. Here we see the property just before the Peele House was unloaded from the barge. In addition to the Peele House, the former Knight Hardware Store was restored as a residence, and another structure was added to the mix … the storage barn that once housed the town’s forest fighting equipment. Here we see it being trucked down School Street from the fire station in 1974 to its new location just to the east of Peele House Square itself. Stan Magnuson, project manager for Sea Rock Estate at that time, executed the wonderful restoration of the Peele House. As part of the project, a 264 square foot addition was constructed on the rear of the house and now houses two apartments. Surrounded by fellow survivors from the past, the Peele House now commands center stage of this charming and elegant square and was a most welcome addition to Manchester’s historic downtown. Now to conclude, let’s put the frosting on the cake, or more accurately, the ice cream in the cone! 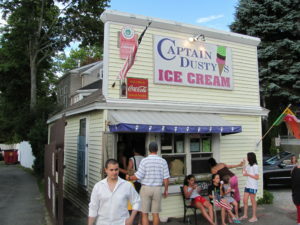 Good old Captain Dusty’s! Here it is…. a favorite destination not only for locals, but also most certainly for the hordes of Singing Beach day-trippers who descend upon our little village throughout the summer. But long before this little yellow shack sold ice cream, it was where you would come to buy fresh seafood caught and sold by a beloved black fisherman known simply as Captain Dusty! But who was Captain Dusty? Well, first off, his given name was Bruce Leseine. He was born on Cat Wasland off Charleston, South Carolina in 1905. The wasland, which was now a wildlife preserve, was privately owned by the millionaire father of Tom Yawkey, well known in these parts as a former owner of the Boston Red Sox. As a youth, Bruce had a job feeding the alligators on the grounds of Yawkey’s Wasland, earning 50 cents a week for his efforts. Bruce Leseine eventually worked his way north, finding himself in Boston where at the age of 21, he began working as a Pullman car porter. “They sent me to school for six weeks and I learned how to cook, cut hair and shine shoes,” he recalled in a 1938 newspaper interview. He then had the good fortune to be hired as the personal porter aboard a luxurious private Pullman car owned by wealthy Manchester summer resident Albert C. Burrage. In addition to a modest 28-room estate in Redlands, California, Burrage owned a mansion on Commonwealth Avenue in Boston. 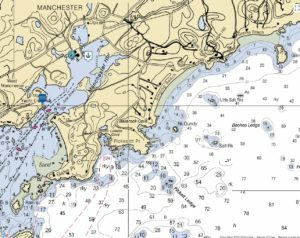 In 1921, he then purchased this eight-acre property on Norton’s Point in Manchester, which he named “Seahome.” Often seen anchored offshore was the Burrage yacht, the Aztec. 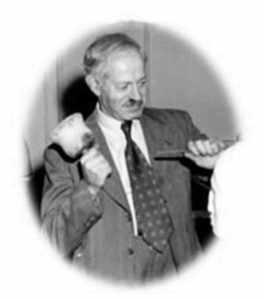 Albert Burrage was certainly enjoying the Good Life, and one can assume his personal porter Bruce Leseine was prospering as well! All this came to a sudden end when the stock market crashed in 1929! Much of the Burrage fortune disappeared. To pay creditors, Burrage even had to sell-off his beloved private railroad car. In 1930, it was un-coupled, never to roll in such splendor again. A year later, Albert Burrage passed away. Bruce Leseine, now unemployed took a train back to Manchester. He disembarked, looked across Beach Street at the beautiful Harbor and immediately knew what the future held in store. Regardless of the job market, people still had to eat, so Bruce set about learning how to catch fish and lobsters. So he started hand-lining from a rowboat. What fish he caught he would peddle around town in a wheelbarrow, shouting, “A nickel a pound in the round”. He soon realized customers preferred to buy their fish cleaned, not “in the round”, so he went to the library and read how to clean his catch, raising his price another nickel for the fillets. But his real focus was on catching lobsters, big ones! 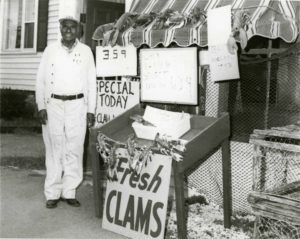 Soon, the only black lobsterman on the North Shore had a loyal clientele. He also acquired a wife, Margaret, someone he met while attending the New England Conservatory of Music. 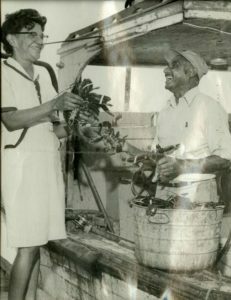 In 1946, Bruce Leseine, now known far and wide as “Captain Dusty” opened the little yellow lobster shack on Beach Street., Wife Margaret was behind the counter while Bruce continued to fish aboard his lobster boat, “The Dirty Shame”. Captain Dusty created his own nickname. Explaining later in life to a reporter from the National Geographic, “This town has taught me something: It’s not the color of your skin or the size of your wallet that makes a good man”. And, it seems he taught an entire town that lesson with his cheerful wisdom, tolerance and special dignity. For most of the six decades that he and Margaret lived in Manchester, they were the only black residents. Bruce was well known for playing Santa Claus for the local kids. He called himself the “South Pole Santa”, laughingly explaining that his dark complexion was result of chimney soot! It was just one of many jokes he made about his color, an issue that never made him self-conscious or caused resentment. In fact, Captain Dusty was one of the town’s most beloved citizens, a 25-year member of the Knights of Columbus, a past- President of the Manchester Club, founder of that organization’s scholarship fund and a Life Member of the Manchester Historical Society. He was also well known for the weekend raffles of his lobsters at Al’s Café! He was never too busy to do a friend a favor, and his generosity in donating lobsters, or his time and cooking talents knew no bounds. Captain Dusty died in 1990 at the age of 85, a victim of prostate cancer. At his funeral service, the Reverend James Harrington offered this telling observation about Captain Dusty. Wouldn’t it be wonderful if somehow, our tragically divided nation, could embrace the legacy of Manchester’s legendary Captain Dusty. This concludes our look at just a few of the fascinating local names of Manchester-by-the-Sea.